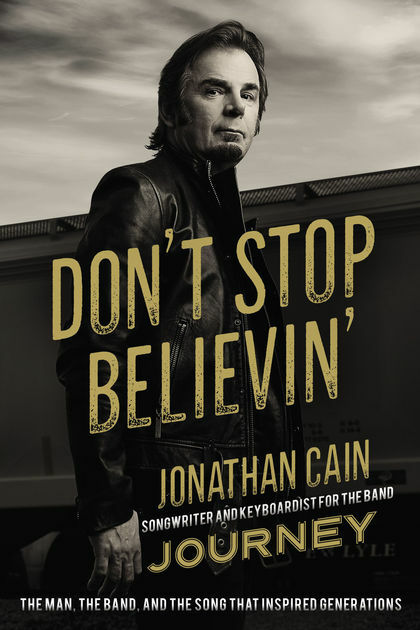 JOURNEY keyboardist Jonathan Cain will release his memoir, “Don’t Stop Believin'”, on May 1 via Zondervan. In the first book by a member of the band, Cain shares his personal story and path to faith as well as behind-the-scenes stories of his 36-year career with one of America’s favorite, multi-hit rock bands, including his inspiration for co-writing “Don’t Stop Believin'”. The memoir was co-written with Travis Thrasher. Cain is represented by Darrell D. Miller of Fox Rothschild, and world rights were acquired by Zondervan acquisitions editor John Sloan. “Jonathan Cain is a legendary musician, but more importantly, he is passionate about sharing his story in a way that inspires, entertains and uplifts his readers just like the music of JOURNEY,” says David Morris, vice president and publisher, Zondervan Trade. Cain is co-writer of the number one digital catalog song in history, “Don’t Stop Believin'”, as well as writer of “Faithfully” and co-writer of “Who’s Crying Now”, “Open Arms” and many more international hit songs. In the memoir, Cain shares stories from his childhood growing up in Chicago and the lasting impact surviving a horrific school fire had on his life. Cain‘s love for music and his perseverance brought him to Sunset Boulevard in Los Angeles where he discovered a wild rock scene before getting his big break. The memoir includes revelations about JOURNEY‘s history, including Steve Perry‘s decision to leave the band, chronicles the massive success along with some surprising failures and discusses the legacy Cain wants to leave through his music. Cain also shares about his marriage to pastor Paula White and what prompted him to release his first solo Christian album. In 1976, Cain released his first solo record, “Windy City Breakdown”. In 1979 he joined the band THE BABYS, and in 1980 joined JOURNEY, rounding out the songwriting genius behind the defining album “Escape”. Cain‘s signature piano, synth playing and songwriting contributions with JOURNEY, THE BABYS and BAD ENGLISH have earned him many Billboard hits, multiple gold, platinum and diamond-selling records, a star on the Hollywood Walk Of Fame, and the best-selling catalog rock song in iTunes‘ history (“Don’t Stop Believin'”). JOURNEY was named as the fifth best band in rock history in a 2005 USA Today opinion poll, was inducted to the Rock And Roll Hall Of Fame in 2017 and continues today, selling out arenas worldwide.